From the grower to the roaster to your favorite cafe, It takes a lot of hands to create a great cup of coffee. Our Friend2Farmer® coffees are harvested thousands of miles away by small-plot coffee farmers. Carefully selected for exceptional quality, the coffee is then roasted in small batches in Columbus, Ohio to preserve the integrity of the bean’s flavor and the farmer’s hard work. To bring you this awesome coffee, Crimson Cup travels to meet the farmers and select the coffees we feel represent their farm the best. With a handshake, we purchase their crop for more than they could get on the open market. Now, we’re working hand-in-hand to develop better coffee and a better quality of life for the farmers, their families and their community. We take several trips a year to make friends and strengthen relationships and help fund local schools and other life-enriching projects. We developed our Friend2Farmer® program because we wanted to go beyond existing Fair Trade and other third party programs to become directly involved in coffee-growing communities. Each Friend2Farmer® coffee is purchased directly from small-plot coffee farmers and then imported, hand-roasted and packaged by Crimson Cup. In the end, we believe that nothing’s better than waking up and knowing the delicious coffee you’re drinking is helping to brew better lives, better coffee and better communities. Check out our Friend2Farmer® coffees. Our relationship with the farmers in Siquatepeque, Honduras has grown over the past 6 years. We are proud to continue to support the community by providing resources to help them create a sustainable future. Crimson Cup’s Brandon Bir recently traveled to Ethiopia and Kenya to strengthen relationships with farmers and discover new coffees. He cupped several hundred coffees while visiting farms, co-ops, wet-mills, unions and coffee exchanges. This year was special, as he was able to share news of the 2017 Good Food Award with Kossa Kebena. We will continue to work with the farmers from the Kossa Geshe co-op in Western Ethiopia’s Limmu Kossa District to create sustainable change. Brandon Bir, coffee sourcing and education manager for Columbus coffee roaster Crimson Cup Coffee & Tea recently traveled into Peru’s Andes Mountains to expand relationships with coffee farmers, agronomists, and others dedicated to improving the quality of the country’s coffee. 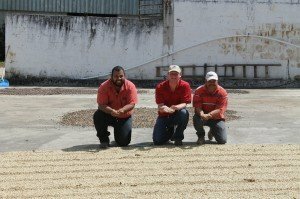 While there, the licensed coffee Q Grader led judging for a coffee competition in the Junín region. 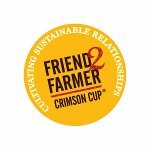 Crimson Cup will evaluate the purchase of coffee from this crop through its Friend2Farmer direct trade program in the future. The roaster developed its Friend2Farmer direct trade program to ensure that farmers receive a fairer share of proceeds from coffee sales. The company pays a premium to farmers, who can then invest in agricultural and community improvements. Crimson Cup coffee experts also collaborate with farmers on ways to improve the quality of the coffee and quality of live for farmers, workers and their communities. In addition, the roaster invests in projects such as solar dryers to help improve coffee quality. With its chocolate fragrance, silky body and pleasing acidity, this shade-grown coffee yields a remarkably clean cup. Grown at 4,600 feet, the fully-washed and patio-dried beans are the pride of 20 small farmers near the town of Olopa in the Chiquimula department of eastern Guatemala. These small farmers draw on a rich history of coffee cultivation, which has been the area’s main source of livelihood for more than 80 years. They recently banded together to market their coffee through the Association of Producers of Olopa Coffee (Apolo) co-op and have begun to win local and regional awards. When Crimson Cup became the first American roaster to visit and establish direct trade, the farmers were as excited to meet our buyers as we were to experience their coffee and hospitality. Impressed by their coffee, growing methods and community, we committed to buying two full containers at a price that gives the farmers additional funds to invest in improving their farms and community. Your purchase helps to improve the lives of these local farmers as they work to establish a sustainable future in the world’s poorest country.